My Bible study group decorated Easter eggs today for our local Rescue Mission to use for their Easter meal on Sunday. Everyone brought a dozen eggs and I supplied the decorations. 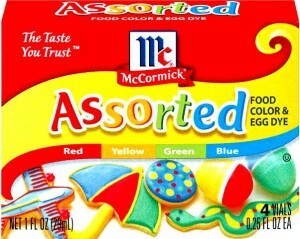 I had the hardest time finding food coloring this year ... two of the markets I went to only carried the gel food coloring. 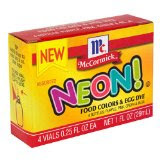 I finally found the liquid and bought 2 packs - McCormick's Assorted (primary colors) and McCormick's NEON. 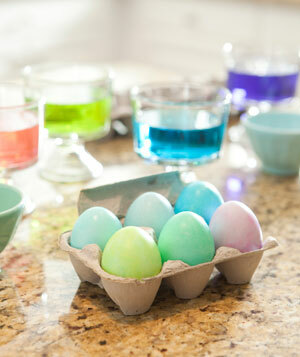 If you have never dyed eggs or have forgotten, you will want to mix about 20 drops of food coloring and 1 tablespoon of vinegar to about 1/2 cup of water. Growing up, we always used boiling water. All the directions I read online said room temperature water. I used boiling; I figured it would turn room temperature soon enough! Start with dry, colored eggs. 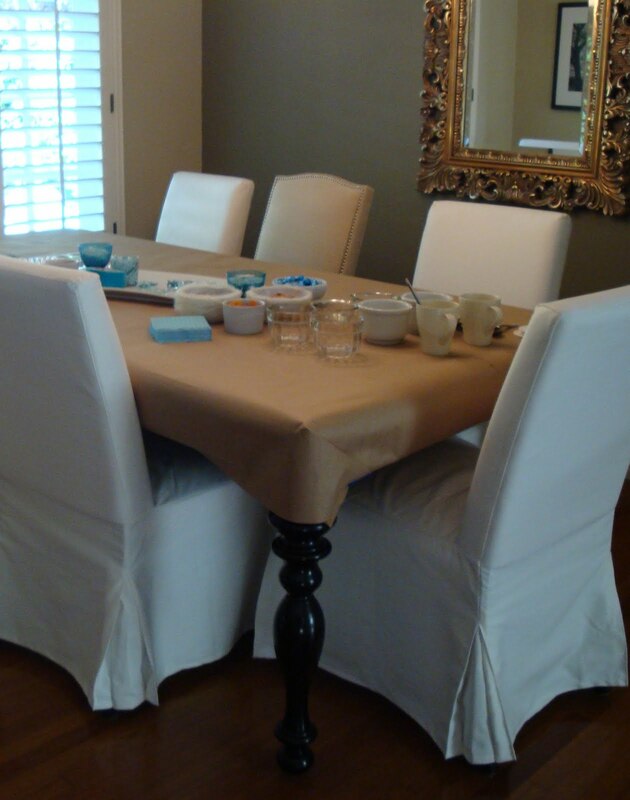 Add 1 tablespoon of vegetable oil to one of the cups filled with a dark colored dye. Run a fork through the mixture. 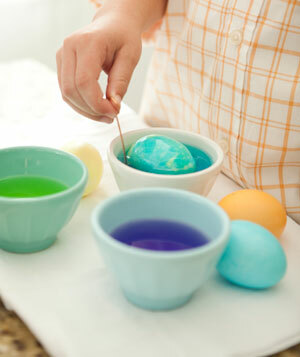 Dip egg into cup and re-dye it in the oil mixture, turning the egg often with a spoon. Carefully remove the egg. Set it aside to dry on a paper towel. Note: I don't know if I like the idea of drying on a paper towel - I use the empty egg cartons. I set out everything we would need to make the eggs and to keep our energy up while working. Other people brought yummy things to eat too. We used a few different techniques to dye the eggs. We used crayons (you write on the egg with the crayon and then dip the egg in dye ... the part where the crayon was will not dye). We also used painter's tape to cute out shapes or words. It works the same as the crayons - under the tape does not take the dye and when you remove the tape you are left with designs or words. ... and even jewels! To put the non stick-on embellishments I put some tacky glue in little bowls and we used tiny throw-away paint brushes. Everyone's eggs came out different and I think they look amazing! My favorite were the ones with the marbling. The oil left a bit of a sheen on the egg which was quite lovely. My votive candle holders worked out just fine to display the eggs. We had so much fun making the eggs. It was fun to see everyone's unique creativity and I absolutely love the way they turned out. Those eggs are so pretty! Beautiful! What a lot of fun, wish I was there. WOW! They look awesome. What a fun activity to share with the Bible study group. I'm sure the Rescue Mission will enjoy them. Using a voitce candle holder for teh eggs is a brilliant idea!!!!!! What a fun thing to do and for such a good cause! They turned out great! What could be better, decorating, friends and food! They all look so beautiful, but the one with the simple cross is my fave. I love your table too with all the decorations and snacks...if I had been there, i would have been soooo nervous with those white chairs!